Primacoustic is now shipping the Paintables versions of its London 8 and London 10 room kits, which aid users in turning any room into a studio or home theater. "The London series of room kits make it super simple to effectively treat many spaces and with this new paintable line, you can eliminate any concern about how the panels will integrate with existing decor," said Jay Porter at Primacoustic. "The kits are an ideal solution for home theaters, two-channel audiophile listening rooms, project studios, video post-production suites, theater projection booths, video conferencing rooms, voice-over booths, broadcast suites, and podcast studios." Designed to address acoustical concerns that are common to all rooms, London kits help control primary reflections, flutter echo, and excessive bass. Panels are mounted using Impalers that eliminate the use of wall-damaging glue. The London room kits include all the necessary hardware, such as wall anchors, screws, and even a drill bit for a quick and easy installation. 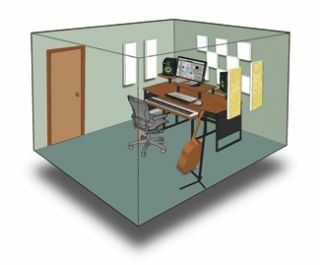 Each acoustic panel is made from high-density 6 lb. glass wool for even absorption, and the panels are edge treated with resin and then fully encapsulated with micromesh to prevent dusting. Originally available in a choice of grey, beige, and black fabric coating, the new Paintables are now available in pre-painted Absolute White, which users can lightly spray paint without disturbing the acoustic properties. The panels have been independently tested for acoustic performance and to achieve stringent class-A fire ratings.